Shipping container at Eco Centro is being retrofitted into a mobile garden. Students who have formed an unofficial horticulture and hydroponics club plan to launch it as an official campus organization in the spring. Environmental science sophomore Ashley Castillo, a participant in the unofficial student club, has volunteered to be president when it becomes official. The group is considering associating with the Botanical Society of America, a decision that will determine the direction of a club name. Castillo said if the group chooses the society, the name could be the Botanical Society at San Antonio College. 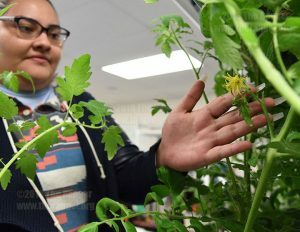 “If we want to make our own club, it would be something along the lines of the Botany Club, since botany is related to the study of plants, not just growing plants,” Castillo said. Engineering sophomore Isaac Olson said the conflict in deciding whether the club wants to be a chapter of the society or their own independent organization is the heavy engineering interest the group has. 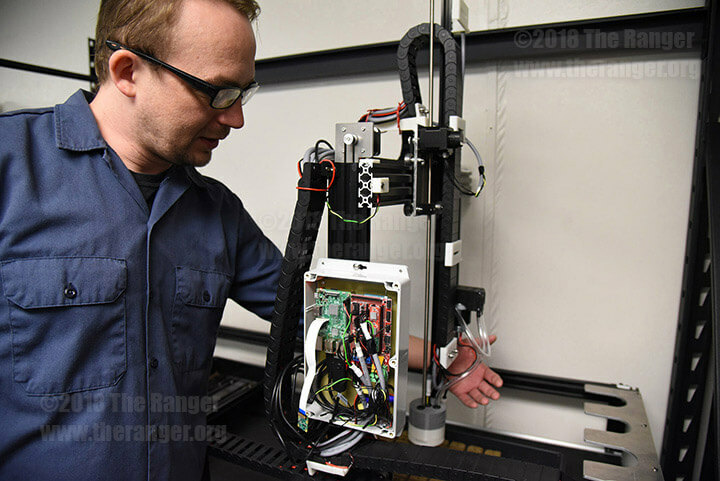 “We don’t want to alienate people that are interested in robotics and things like that, too,” Olson said. He said a club with the name Botany Society may look like just a gardening club. Olson said a club goal is to include students from multiple majors, not just botany. Steven Lewis, grant writer and administrator at Sinkin Eco Centro, said hydroponic projects have been at this campus under grant funding for almost six years. “Within the last two years is when the projects have come more into the form that they are today, horticulture and automation,” Lewis said. Lewis said the group was initially housed at Eco Centro, but was moved to its current location, Room B200 of the community engagement annex, three years ago. He said the group is primarily funded through a sub-grant titled the Evergreen Grant from the Department of Agriculture. Olson said the group has several projects in the works. One project group is working on is developing a hydroponic prototype for a shipping container. “On the grounds of Eco Centro, we have a shipping container that’s slowly being retrofitted to have a mobile hydroponics system in it,” Olson said. Olson said a main focus of the project is testing how closely plants can grow in the limited space. “We can get about 2,500 plants in our 40-foot shipping container,” Olson said. The prototype is built to scale in height, around 8-feet, but the length and width is roughly one-eighth the size of the shipping container. “When we were designing it we thought, ‘OK, let’s start out with a smaller scale before we build out the whole unit,’” he said. Olson said the group researches which plants should go into the prototype that produce high yields, such as basil. “We’re focusing more on herbs so they fit within our volume but also our price range as well,” he said. The prototype holds 288 plants that can grow up to 14 inches tall with a 40-gallon water reservoir. 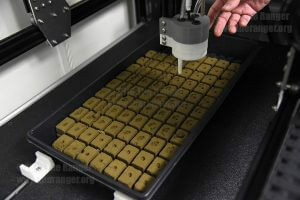 A single seed is placed inside a “horticube,” a sterile phenolic foam similar to rockwool that will house the seed from propagation to transplantation. Olson said depending on the species planted, the seed can sprout within two days. Water is carried through a 2-inch diameter polyvinyl chloride pipe to each plant before cycling back down into the reservoir. “This particular system is known as the ‘nutrient film technique,’” he said. Olson said in this technique a thin layer of water is constantly run over the roots of each plant. Olson said “algae blooms,” an industry wide issue, occur when stagnant water is in a hydroponics system or even by opening a door. “We’re not seeing this as much in our nutrient film system because the water is constantly running,” Olson said. Olson said Castillo is working on a hybrid version of the nutrient film technique. “It’s called ‘ebb and flow,’ where you pump water into the tray and submerge the roots, but then you drain it out,” Olson said. Castillo said typically she will flood a tray with 3 to 4 inches of water for around five minutes before draining the water. She said flooding the tray and submerging the roots removes the old oxygen held by the plant. “Once it drains out, it pulls in fresh oxygen for the roots to absorb and use,” she said. Castillo said she is also developing two vertical towers as part of her ebb and flow demonstration that will hold strawberries and baby cucumbers to showcase ways people can use hydroponics vertically and horizontally. Olson said added benefits of hydroponics include the reuse of excess water and direct fertilization. The club is also developing a “farm bot,” a self-seeding automation machine. Olsen said the project is trying to improve the accuracy of the farm bot. He said horticubes look as if the hole for the seed is in the center, but slight manufacturing errors offset it. “Over time, we lose our accuracy,” he said. Olson said to circumvent the problem, instead of coding the machine to plant seeds a certain distance apart, it will use computer vision to see holes and plant a seed directly. He said if the hole is off-center, the system will notice it and compensate by shifting over to plant the seed in the center of the horticube. “Your program is only as good as the information you feed it,” Olson said. He said those interested in becoming involved with coding and hydroponics can email slewis71@alamo.edu or visit during lab time 10 a.m.-3 p.m. Friday in the spring in Room B200 of the annex.